April 21, 1866 Circleville, Utah, during the Black Hawk War 24 Paiute men women and children innocent of any wrong doing, were brutally murdered, their throats cut one by one then buried in a mass grave to be forgotten. Three children made their escape only to be captured the next day. This was one of the worst tragedies in Utah's history. In this essay Mr. Gottfredson gives a detailed account of the massacre followed by a series of interviews and letters from the living descendents of the only known survivor David Munson. Mr. Gottfredson attended the memorial commemorating the massacre is Circleville accompanied by Mary Meyer Executive Chief of the Timpanogos Nation, and gives his firsthand account. Mr. Gottfredson researched the Circleville Massacre for nearly six years. By 1866 Mormon and Indian confrontations were raging in all directions, it was ordered by church officials to have the Paiutes disarmed. Timpanogos War Chief Black Hawk and his band had killed many during the year before while defending their rights to their land. A determined camp of Paiutes remained in Circle Valley (Box Creek - now Circleville) and were trying to be friendly and get along with the whites. However, the whites felt that they were in danger every moment, as reports of Natives in other places were so aggressive saints felt that real trouble could break out at anytime. On April 21, 1866, an express from Fort Sanford reached Circleville, Utah telling of a Paiute that pretended to be friendly had shot and killed a white man who belonged to the militia stationed at the nearby fort. The people of Circleville were told to protect themselves against the Indians who were camped in their valley. Though residents in Circleville had no cause for concern with their neighbors whom they had befriended, upon receipt of this information the people of Circleville called a town meeting, and after much discussion as to what they should do, it was decided that they should arrest all the Paiutes that were camped nearby, and bring them to Circleville for confinement. Every able bodied man in the town set out to take custody of the Indian camp, and they surround the camp at night. They had no reason to use force, relations between them had been amiable. However, James T. S. and Bishop William Jackson Allred went to the Indian camp, and under false pretences persuaded the Indians to come to a meeting at Circleville. They told the Indians that they had received a letter from Brigham Young, and they wanted to have it read to them. All of the Indians agreed willingly to go to Circleville with the men, *except one young Indian warrior who refused to go and began to shoot at the posse. The posse returned fire killing on the young man. The rest of the Indians were then taken at gun point to Circleville, a mile away, and the letter was read to them. The Indians were told that they are to be retained as prisoners, and were taken into custody and placed in the meeting house that night under guard. Now, Oluf Larsen gives a slightly different account, and Oluf was one of the guards who participated in the killings. He said: "We naturally concluded the Indians were planning something. This led us to call a council to consider what was best to do about them. We concluded it was best to take them prisoners, feed and care for them until we could get information from higher authority. In the evening, we went quietly down and encircled their camp. We closed up quite well, so none should be able to escape if they tried to break away. A man by the name of James Allred [James Tillman Sanford Allred] who spoke the Indian language very well, and who had considerable experience among them, and knew their customs quite we,l showed them the necessity of complying with our wishes telling them they would be treated kindly, and would show their friendship by moving into town. No sooner had he explained this than *one Indian jumped across the river where I had my position and in the twinkle of an eye, the men opened fire and the bullets whistled around my ears. Just as the Indian fell, he discharged his gun. The bullet grazed my breast and cut the barrel square off the gun of the man by my side. Had the bullet come three inches nearer, it would have killed both of us. All the other Indians surrendered and we marched the men into the meeting house, and we placed them under guard. Later we went and moved the squaws and children and belonging[s] into a vacant cellar with guards watching them." The captured Indians, 26 in all, showed a lot of unrest, then on the evening of the following day some of the Indians were able to cut themselves loose from their bindings and make a break. In the excitement the two Indians trying to free themselves were shot and killed by the guards. The remainder of the Indians were then taken from the meeting house to a nearby underground cellar and imprisoned there. The captured Indians knew they were going to be killed, they could feel it. The settlers had another meeting, and it was decided among them to kill the remaining captured Indian people. And so it was that one by one they were led out of the cellar, 24 in all. There were women, men, and children, and they were first struck from behind on the head to stun them, then their throats were cut. A terrified mother of two young boys and one girl, between thirteen and seven or eight years of age, told her crying children to run for their lives. When the door was opened for the next victim the three made a break and forced their way past the guards and ran. In the dark of night the guards fired several shots at the three but were unable to hit them. One was shot in the side but the bullet barely grazed his rib, not enough to stop him. It is safe to say the mother never knew if her children had managed to escape. Her children would wait through the night in vein for the return of their parents. The day after following the massacre, the now three orphaned children who had made their escape were found in a nearby cave (above). They were taken by James Allred to Marysvale, a nearby town. It was Allred's intention to sell or make a trade for the children. According to accounts, no one wanted the little girl. There, in Marysvale, the captured girl was taken by her heals and swung hitting her head against a wagons wheel until dead. It is unclear what happened to one of the remaining two boys, whether he also killed or managed to escape, but James Allred took the remaining boy on to Spring City. When Brigham Young heard of the details of this heinous crime he was upset, but did nothing more than verbally chastise the murders. Later they were praised by Church members for having done their dirty deed well. The so called "saints" of Circleville did all they could to cover up the tragic event, saying that they acted in self defense when the Indians attacked the guards. But in time the event leaked to the news, but curiously not a single person was prosecuted. No record of the names of the victims. There remains yet another important question, where are the remains of the 26 victims buried? Gottfredson made a trip to Circleville and while he was there he was introduced to those who knew the story and had lived there all their lives. Phillip was shown where the victims are buried in Circleville. Phillip have since turned over all of his three years of research on this event to the Paiute Tribal Council along with full rights to the material. What Phillip have discovered about the Circleville massacre he feels is history that first belongs to the Paiute Tribe, and what they do with it is entirely up to them. For example, if they should desire to exhume the burial site or place a maker there to honor their ancestors, it is they who he felt should have my research for this reason. Circleville was abandoned shortly after, and the bishop with his wife and children went to Cedar City where he went to work as a ranch hand. Circleville was abandoned in the same year. According to census records provided to me by the Timpanogos Nation of the Uinta Valley Reservation, Mormon Anson Call (born July 9, 1834 and died August 4, 1867), Mr. Call adopted a Piede Indian girl they named Ruth Call. Ruth Call was born May 13, 1849 in Fillmore and married James Henry Davids in Millard County December 25, 1864. Ruth died September 19, 1919. According to Osmond Call who submitted the record to the LDS Archives in 1960, Ruth survived the Circleville Massacre. She would have been 17 years of age. A second document the Timpanogos gave me was submitted by Emma Jean Hatch to the LDS Church Archives Sept. 17, 1993 also shows Ruth Call, and noted she was a survivor of the Circleville Massacre. This is the first time I have seen any evidence of a girl who survived the massacre. And of coarse this leaves us with many questions yet to be answered. I had the honor of meeting with several descendents of one of the one boy that survived the massacre, who's names will remain anonymous. Upon reading documents from these persons accounts I found the following: The account said, "A day following the killings, two Indian boys and one girl were found hiding in a nearby cave, and where taken to the nearest town Marysvale, Utah. Jackson Allred then took one of the boys, who may have been 8 or 9 years of age at the time, to Spring City. There Allred spoke with a family who was interested in taking care of the boy, and said to them that he would trade a horse for the boy, otherwise he would just kill him. Allred agreed to the payment of a horse and a bushel of wheat, and the Monson family took the boy in and raised him. He was given the name David Munson. The boy was locked in a shed for some time. David Munson lived to be about 67 years of age, he moved to Wyoming. He married and had children. He was buried in Saratoga, Wyoming." "Saratoga Sun February 19, 1925 "Indian Dave" Munson Dies Very Suddenly Well Known Local Character Expires at Tie Cap Sunday – Heart Failure the Cause Heart failure is given as the cause of the sudden demise of Dave Munson, commonly known as "Indian Dave" who fell over dead while loading ties at the Ryan camp on Cedar Creek last Sunday morning It is said that Munson was apparently in his usual good spirits that morning, and that he cared for his horses and ate his breakfast as usual. Shortly after beginning the day's work, and while engaged in loading ties on a sled for transportation, he suddenly fell over in the snow and expired. He had been employed at the camp for several weeks. Funeral services were held at the Episcopal church on Tuesday and the remains interred in the local cemetery. No relatives of the deceased man could be located by Undertaker E. L. Gould, though he wired to all points where it appeared that any information could be gained. It is common talk here that Munson had several sons and daughters residing somewhere in Utah, but no authentic information as to their names or whereabouts could be obtained. 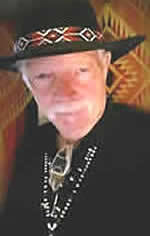 Munson was a full-blood Paiute Indian, and had made his home in this region for the past 12 or 15 years. He had told friends that his parents had been killed in an Indian War in Utah when he was but three years old, and that he had been raised by a Swede family named Munson, whose name he adopted. He also told of once having a wife and several children, during his residence in Utah. Some 15 years ago he came to this valley, working at sheep shearing and herding. Of late years he had done common labor of all kinds. No one knew his exact age, and it is said Munson himself did not know how old he was. Those who knew him best however, estimate that he was approximately 60 years of age. Further effort will be made to notify his relatives, in case any clue can be discovered as to their whereabouts. Family links: Children: Arthur Leroy Monsen (1899 - 1927)* *Calculated relationship Note: Born: Utah Died: Carbon Co., WY Burial: Saratoga Cemetery Saratoga Carbon County Wyoming, USA Created by: Judy Cowen-Hodges Record added: Dec 22, 2009 Find A Grave Memorial# 45695833 Indian Dave Munson Added by: Suzanne Turnbow Indian Dave Munson Added by: Vickie Mae Bills,Supera Indian Dave Munson Added by: Judy Cowen-Hodges There is 1 more photo not showing... Click here to view all images... Photos may be scaled. Click on image for full size. R.I P. YOUR HOME NOW WITH THE LORD. - Vickie Mae Bills,Supera Added: Jun. 3, 2013 David Monson (aka "Indian Dave Munson") was a full blooded Paiute Indian. He was one of only three children to survive the Circleville, Utah Massacre of his family and other members of his tribe by early Utah settlers. He was taken by a white man to Spingville(Read more) - Added: Mar. 16, 2013"
Thanks to Vickie Supera for providing the above article. I received information from another descendent of David Munson, he stating that according to his records the two boys and girl were siblings. David Munson witnessed the killing of his sister. I received the Oluf Christian Larsen account from his g-g-g-grandson. The significance of this account is that it provides proof that the Paiute involved were innocent of any wrong doing contrary to previously believed to be accurate accounts. Special Thanks to Dave Larsen - Retired School Teacher. This is an excerpt: Olaf Christian Larsen wrote, "At this time our friendly Indians had not been in the valley for several days, and we could not help being suspicious of them. They could easily have informed the others in regard to our condition. After they returned, they camped close to town by the river where we observed some strangers coming and going from their camp. We naturally concluded the Indians were planning something. This led us to call a council to consider what was best to do about them. We concluded it was best to take them prisoners, feed and care for them until we could get information from higher authority. In the evening, we went quietly down and encircled their camp. We closed up quite well, so none should be able to escape if they tried to break away. A man by the name of James Allred [James Tillman Sanford Allred] who spoke the Indian language very well, and who had considerable experience among them and knew their customs quite well showed them the necessity of complying with our wishes telling them they would be treated kindly and would show their friendship by moving into town. No sooner had he explained this than one Indian jumped across the river where I had my position and in the twinkle of an eye, the men opened fire and the bullets whistled around my ears. Just as the Indian fell, he discharged his gun. The bullet grazed my breast and cut the barrel square off the gun of the man by my side. Had the bullet come three inches nearer, it would have killed both of us. All the other Indians surrendered and we marched the men into the meeting house, and we placed them under guard. Later we went and moved the squaws and children and belonging into a vacant cellar with guards watching them. Express was sent across the mountains to Beaver, the nearest place we could get in communication with the leading authorities as we did not like to take the responsibility of deciding the course to be taken with the Indians. While thus being guarded night and day and they knowing we could not understand them, they held their council how to liberate each other. The plan they made failed and brought upon themselves an early destruction for if they had depended on us they might have been liberated in a few hours receiving gifts from us. A few men in the community exhibited great hatred to the Indians, but they were too few to have any influence, as the people in general abhorred the shedding of blood. Every moment we expected our pony express to return but before they returned the Indians made a bold break for liberty. The Indians were seated with sticks across the small of their backs and their elbows back of the sticks were tied to the sticks. While close together with blankets thrown across their shoulders, they untied each other and were loose ready to make their escape as soon as it was dark. I had just been released and the new guard placed - had not proceeded far when the shooting began. I ran back to the meeting house and the Indians were all shot and in a dying condition. I learned from the guard that they all arose at once pulled the sticks from their arms, sprang for the guards and tried to knock them down. To protect themselves they were forced to shoot. The next consideration was how to dispose of the squaws and papooses. Considering the exposed position we occupied and what had already been done, it was considered necessary to dispatch everyone that could tell that tale. Three small children were saved and adopted by good families." I received this update from D J Monson: "John Munsen's grandfather, Arthur Leroy Monson, born 21 Jan 1898, was killed in a mining accident at Winter Quarters Coal Mine in Nov. 1927 at age 29. He had been hired there with the help of his sister's (Edith) husband Gibbs Monsen (note spelling) who also worked there. Because Arthur could not write or read very well his name was spelled the same as Gibbs. When time came to erect his headstone, the mine and Gibbs family provided the money. His last name was incorrectly spelled Monsen. His young children, one of which was Jack Monson (the youngest) while going to school had inadvertently used the spelling Monsen. Somewhere during Jacks lifetime and as he enlisted in the Navy the spelling graduated to the phonetically sounding Munsen. He never corrected it. Thus along came John Munsen. This is as told to me by my mother June Monson Unopulos Nielson and told to her by Eloise Monson, wife of Arthur's brother Leonial Monson. It has been very painful to relate this account, and have done so not for amusement or to be disrespectful, but to remember this tragedy to remind us of the terrible circumstances the Native people of Utah have endured. Our goal, the Black Hawk War Project, is to reveal the true story of the Black Hawk War in Utah. To honor those who this day morn the past in silence because they have been ignored and forgotten. Dear Phil: I just found out about my past because it was kept from me by my Father. Someone, and I have not found out who it was, mailed my great-grandfather's family chart to me that included his children. I have just started ti investigate and try to locate the source of this material. There is no doubt that it is correct as you do not need to do DNA testing to see the connection between me and my grandfather's picture included on the papers. My father would never tell me of any of his relatives so I am having a time finding someone to answer some of my questions. I live in Central Louisiana, by Colfax and most of the people listed are passed away and lived in Utah. What I have learned is that my great-grandfather was adopted by Peter & Bertha Monson in 1866 after the Circleville Event from Spring City, Utah. David Monson was his name with his adopted parents. I doubt if I will ever know his real name. He married Laura Sena Jensen in July1,1887. They had 8 children. Fourth Child Arthur Leroy Monson born 1/21/1898 was my grandfather. My father was born out of this marriage. I am having difficulty finding this generation because my grandfather, I have been told, but can not find records of was killed in a mining accident in Kenilwoth Carbon, Utah in 11/6/1926. This genealogy is on FamilySearch.org I am going to a LDS center locate not to far from my home this Thursday to start some additional research. Please feel free to do your own. I hope that this information is helpful. The compiler of this information was Norma Lois Vance in 1986 and I have not been able to locate her. Thanks for your interest; John A. Munsen,Jr. Dear Phil: Thank you very much. David Monson was my great-grandfather and was one of the survivors from the Circleville Murders. The Paiute Indians is the local tribe name. I will be going to the local LDS center on Thursday morning and a volunteer is going to help me. I would very much like to find some of my Indian relatives I feel my Heritage was stolen from me. I am very much an outdoor person. I am a beekeeper and bee breeder is how I earn my living. Thanks Again: John A. Munsen,Jr. At this historic dedication of the Circleville Massacre Monument, historians and speakers gave a fair and accurate depiction of the tragic event of 1866 when 27 Paiute Koosharem men women and children were brutally murdered by members of the Mormon Church. Approximately 25 Koosharem Paiute were present at the dedication along with some 40 or so people comprised of historians from the church of Jesus Christ of Latter-Day Saints, Shirlee Silversmith Director of Indian Affairs, members of the Northern Ute Tribe, along with towns folk and the press. I was there along with Mary Meyer Chief Executive of the Timpanogos Nation, and a direct descendent of Chiefs Arapeen, Walkara, and Tabby. The ceremony lasted over an hour. And following the ceremony there was talk among the Paiute and historians of locating the burial place of the Massacre victims and a possible repatriation of their remains to bring closure to those whose ancestors were involved in the atrocity. There appears to be a sincere and united effort between Native peoples of Utah and the Church to respectfully recognise this darkened part of Utah's history. Unlike other such attempts in the past, this time things had a much different tone of honesty and bold directness when addressing the details of the Massacre. None of the speakers sidestepped or sugar coated the story. And I want to commend Church Historian Richard E. Turely for his candid remarks. Mr. Turely openly admitted during his speech that one of his ancestors were among those who committed the atrocity, and that he deeply regretted that it happened. I think that took a lot of courage, and I have deep respect for Mr. Turley for his honesty and directness setting an example for others follow. I met Mr. Turley for the first time afterwards and thanked him for his tremendous contribution. 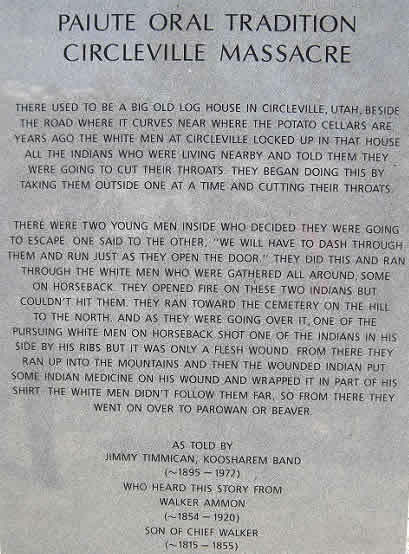 It was said a couple times by different speakers, and now reported the same in the media that "the Circleville Massacre was the largest and most brutal that occurred in the State of Utah." Interesting, because Utah didn't achieve statehood until 1896. And what about the Bear River Massacre of 1863 where some 500 Shoshone were slaughtered by Col. Conors? Church leader Brigham Young supplied troops and supplies to Conors to rid the area of Indians to benefit Mormons occupying Cach Valley at the time. Mayor Michael Haaland of Circleville expressed his dedication and support of this project, consistent with the time I worked with him back in 2010 when I spent an entire day in Circleville investigating the Massacre. Mr. Haaland told me then he would support there being a memorial of this kind, and the possible locating and repatriation of the mortal remains of the victims. My only disappointment is that there was no recognition of Norma Vance's contribution to the history of this event. Her decades of research, her book, or that she was a direct descendant of David Munsen, and furthermore all of David's descendants I believe deserve recognition of which there was none given. But, this project is not complete and I am confident there will be ample opportunity for recognition and much needed healing in time ahead. Speakers of the dedication did point out that there are many who deserve recognition beyond those who took part in this first phase of the project, and that there is no one individual, group or organization that deserves all the credit. It was a great day to be there and witness this historic moment. The monument is beautifully done and inscribed on both sides. And I would say this was long overdue, it signals the beginning of more to come. A monument of this type, and the manner which it was presented at least acknowledges this tragic event happened which is good, and it in some way helps to console those who's ancestors took part in the massacre, but it must be understood that no monument excuses those who murdered 27 innocent men, women, and children. And having pity or expressing pity to the descendants of those victims in no way heals hearts, or reconciles the atrocity, much less makes them feel better. The monument and the intentions behind it is a small but important step toward reconciling the past, and serves to teach and remind us that mistakes our ancestors made must never be repeated. That greed, selfishness, and religious fanaticism can led to senseless savagery. 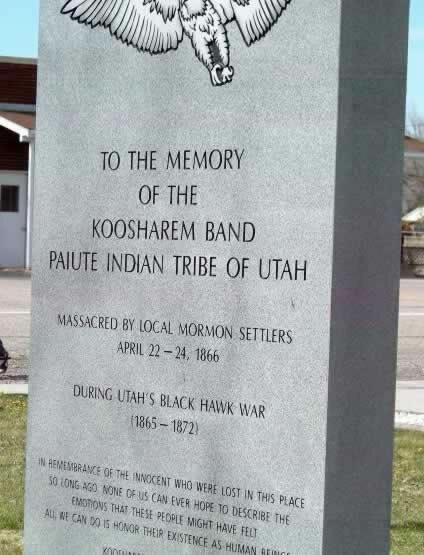 The Black Hawk War of Utah spanned some 21 years, over 150 bloody confrontations resulting in the genocide of some 70,000 Native peoples living in Utah when Mormon pioneers arrived in 1847. Dr. Daniel McCool University of Utah put it succinctly when he said, "We took from them almost all their land—the reservations are just a tiny remnant of traditional tribal homelands. We tried to take from them their hunting rights, their fishing rights, the timber on their land. We tried to take from them their water rights. We tried to take from them their culture, their religion, their identity, and perhaps most importantly, we tried to take from them their freedom. And what is so amazing about this whole story is that we failed. We failed after hundreds of years of trying to take everything from American Indians. We failed to do that. They're still here and there's survival; that great saga of survival is one of the great stories of all mankind." The United States Government, our government has never honored even one of some 360 ratified treaties made with Native American Indians. True Indian history has been ignored and left out of our school curriculum. So, this monument, long over due, honors the Native peoples of southern Utah and acknowledges the tragedy of 1866 in Circleville, but we have a long ways to go toward reconciliation for all the Native American Indians not just in Utah but across America. On June 6, 2010 I was in Circleville researching the massacre. I first contacted Mayor Michael Haaland and we had a good conversation about my purpose for being there, and Mayor Haaland was very helpful. While the Mayor said he knew little of the event, he did give me the phone number of Paul Morgan who had lived in the town all his life. It turned out that Mr. Morgan had lived neighbors to a cousin of mine. I spent the afternoon with Paul as he drove me around the town pointing out different historical sites. Paul then introduced me to his long time friend Dale Peterson who had spent several years researching the massacre. Dale also drove me around town pointing out different historical sites and buildings. He then took me to the elementary school on about Center street and 400 south and told me this is where he believed the meeting house was. He said the school building was built on the same site as the old meeting house was, saying that according to early accounts the settlers first built log cabins on the east side of the river then later move to the west side of the river to higher ground. His account aligned with what Paul had told me. Paul owned the dairy farm there on the east side of the river and told me that when plowing his field he kept hitting large foundation stones that were laid out in a rectangular fashion. When speaking with Dale at the school, he then told me that when he was a young man he was told by an old-timer by the name of Gerald Horton that the Indians who were killed were buried in a cellar, a dugout about 15 x 20 feet located a short distance from the meeting house. And that this was located underneath what is now the tennis ball court on the west side of the school. He said when the school was being built that while excavating the grounds human remains were found at this location and were then immediately covered up. Then it was decided to pour a concrete slab over the spot and create the tennis court. The dugout, Dale explained, may not have been used for potatoes as early settlers dug shelters into the ground to live in until they could build cabins. Then the dugout may have been reproposed as a storage sellar, perhaps for potatoes. I repeated this story later to Paul and he said he knew Gerold as an old-timer and he had also herd the same story from two other old-timers who said the same thing. Dale believed the victims are buried there saying "all they had to do was collapse the dirt roof on them" making an instant grave. I had told Dale that during the massacre, three children had escaped and ran a mile to the west and hid in a cave. "I have lived here all my life, and I can tell you there are no caves." Then he asked me, "how far did you say?" 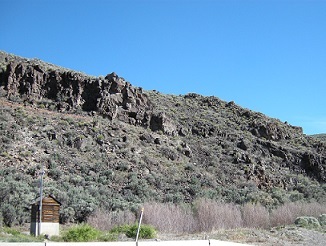 We then headed west one mile according to his trucks speedometer and there we came to an hill of volcanic rock. Dale said, "here are ledges as you can see, small kids could hid in those spaces I suppose." I agreed, it could be a likely place. He then told me, "If you climb up on top there you will see a rock with some pictographs on it." To me, when he said that everything made sense why the children would seek refuge on this hill, to the Native people there this was a sacred site.